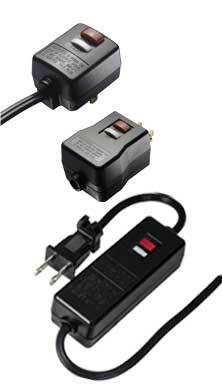 Tower offers Appliance Leakage Current Interrupters (ALCIs) to meet your particular requirements. The main difference between GFCI and ALCI products is that GFCIs not only sense current imbalance, but also have the ability to identify improper wiring. ALCIs are used as components on appliances, where wiring conditions can be guaranteed. Typical applications for ALCI products are portable appliances such as bathroom heaters, carpet cleaners and hair dryers. The ALCI will trip and remove power with an imbalance of current or if the portable appliance is immersed in grounded water (i.e., sink, tub, etc.). All Tower ALCI products are UL approved.